DASYLab™ Software: A graphical programming software package that serves the data acquisitionb user who requires customized applications but doesn't have the time, training, or inclination to write code. With DASYLab, you can quickly develop data acquisition and control applications simply by creating a flowchart in which functions are connected by wires. InstaCal: Installation, Calibration and Test software in one package simplifies these important steps as you turn your PC into a measurement system. 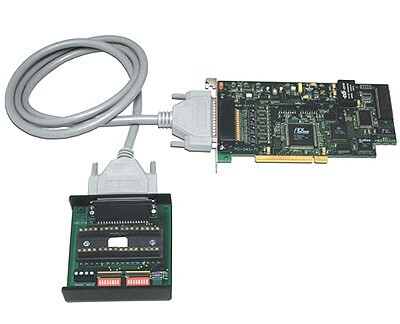 Installation detects new hardware and configures your computer and board. Calibration software automates this critical step and keeps your measurements accurate. Test routines verify that all the board's features are operating, and will speed you to a quick resolution. If you need to, call our free technical support. Included free with every board. Measurement Studio MCC Edition: An integrated suite of measurement and automation controls, tools, and class libraries for Visual Studio 2005, and Visual Studio .NET 2003. Measurement Studio dramatically reduces application development time with ActiveX and .NET controls, object-oriented measurement hardware interfaces, advanced analysis libraries, scientific user interface controls, measurement data networking, wizards, interactive code designers, and highly extensible classes.